New SE Plus and SXT Plus option packages, which essentially replace last year’s 30th Anniversary models with nearly identical equipment, debut for the 2015 Grand Caravan. This is widely expected to be the minivan’s last year on the market, as Dodge shifts to a performance-oriented focus and the Chrysler Town & Country takes the minivan mantle for the automaker. 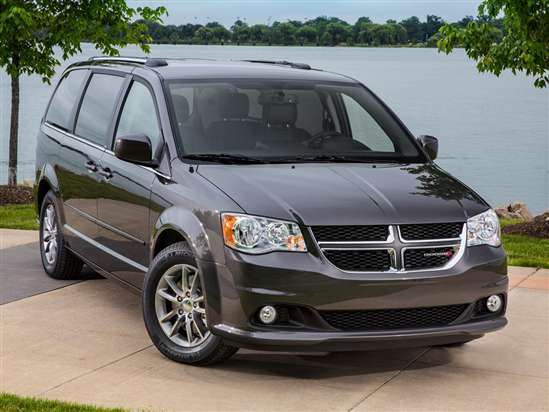 Four versions of the 2015 Dodge Grand Caravan are on sale: American Value Package (AVP), SE, SXT, and R/T. For a wider variety of options, it is necessary to upgrade to the Grand Caravan SE at a minimum. This model includes, in addition to AVP equipment, dark tinted rear windows, second-row Super Stow ‘N Go seats that store in the van’s floor, a 3-zone air conditioning system, added stereo speakers, and nicer trim. A new SE Plus Package adds dark-finish 17-inch aluminum wheels, body-color heated side mirrors, piano black interior trim, black cloth seats with accent seat stitching, a black headliner, black leather-wrapped steering wheel and shift knob, power second-row windows and third-row vent windows, an auto-dimming rearview mirror, Uconnect smartphone pairing with Bluetooth hands-free calling and music streaming, and one free year of satellite radio. A Blacktop Package is also available, mixing and matching some Plus Package equipment with a sportier blacked-out exterior appearance. The Blacktop Package is also available for the Grand Caravan SXT. Get the SXT, and your minivan will have dual power sliding side doors, a power rear liftgate, heated side mirrors, power second-row windows, power third-row vent windows, and a Stow N’ Place roof rack. Add the new SXT Plus Package for chrome exterior trim and interior accents, automatic headlights, fog lights, and polished wheels. Leatherette seats with imitation suede inserts are also standard, along with a 10-way power driver’s seat. The Grand Caravan R/T is equipped with a sport suspension and a monochromatic trim treatment, plus leather seats with red accent stitching, a premium sound system, remote engine starting, and an upgraded infotainment system with a reversing camera. Every 2015 Grand Caravan is equipped with a 283-horsepower, 3.6-liter V-6 engine and a 6-speed automatic transmission that delivers the power to the front wheels. According to EPA ratings, the Grand Caravan returns 20 mpg in combined driving. The NHTSA gives the Grand Caravan a 4-star crash protection rating, though it is worth noting that the van does not score below 4 stars in any individual test. The Insurance Institute for Highway Safety (IIHS) says the Grand Caravan earns “Good” ratings in the four crash tests that it has conducted, the highest accolade. However, as this summary is written, the IIHS has not assessed this family-hauling Dodge in its tough small overlap frontal-impact test. Dodge offers an optional Safety Sphere Package for select version of the Grand Caravan, and it contains rear parking assist sensors, a reversing camera, rain-sensing wipers, and a blind spot monitoring system with a rear cross path detection system.